The Acid Krush Candela wraps a gorgeous green Candela leaf over the one-of-a-kind aromatic infused tobaccos you know and love, creating a bold new profile for the Acid portfolio. Grab yourself a box of the radically delicious and satisfyingly sweet Acid Blondie Candela today! these have became my favorite cigar ... i love them. Excellent selection of cigars. Easy, secure checkout. Cigars arrived promptly, and fresh. I've ordered the same cigars from other companies but none arrived as fresh as these. Also, out of a the companies I've ordered from, BCP had the best prices. Great selection, great prices, and freshness on arrival....what more are you looking for? 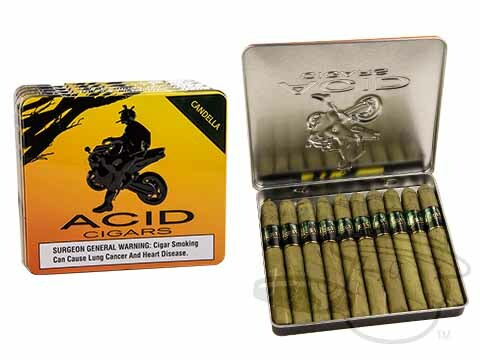 Acid Krush Green Candela is rated 4.6 out of 5 based on 4 customer ratings.